Citation Information: J Clin Invest. 2007;117(3):683-692. https://doi.org/10.1172/JCI28523. Aminoglycosides can readthrough premature termination codons (PTCs), permitting translation of full-length proteins. Previously we have found variable efficiency of readthrough in response to the aminoglycoside gentamicin among cystic fibrosis (CF) patients, all carrying the W1282X nonsense mutation. Here we demonstrate that there are patients in whom the level of CF transmembrane conductance regulator (CFTR) nonsense transcripts is markedly reduced, while in others it is significantly higher. Response to gentamicin was found only in patients with the higher level. We further investigated the possibility that the nonsense-mediated mRNA decay (NMD) might vary among cells and hence governs the level of nonsense transcripts available for readthrough. Our results demonstrate differences in NMD efficiency of CFTR transcripts carrying the W1282X mutation among different epithelial cell lines derived from the same tissue. Variability was also found for 5 physiologic NMD substrates, RPL3, SC35 1.6 kb, SC35 1.7 kb, ASNS, and CARS. Importantly, our results demonstrate the existence of cells in which NMD of all transcripts was efficient and others in which the NMD was less efficient. 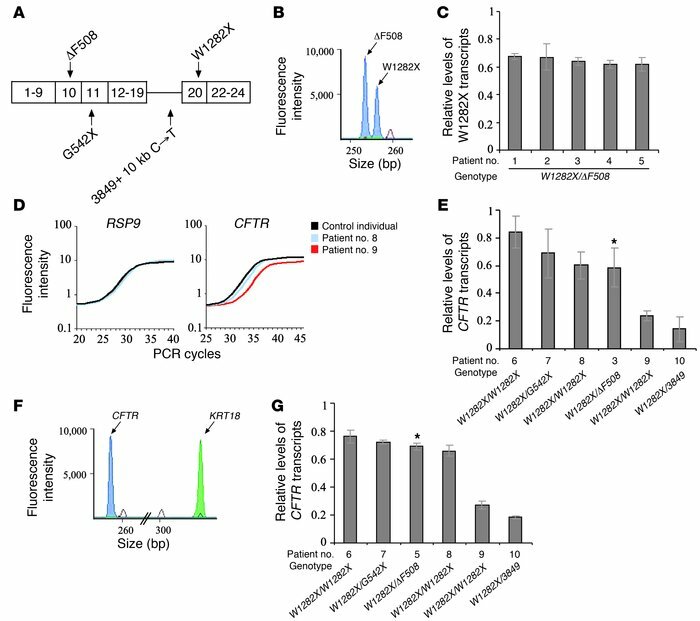 Downregulation of NMD in cells carrying the W1282X mutation increased the level of CFTR nonsense transcripts and enhanced the CFTR chloride channel activity in response to gentamicin. Together our results suggest that the efficiency of NMD might vary and hence have an important role in governing the response to treatments aiming to promote readthrough of PTCs in many genetic diseases. Levels of CFTR nonsense transcripts in nasal epithelium of CF patients. (A) A scheme of localization of the CFTR mutations carried by the studied patients. The numbers within the boxes mark the CFTR exons. The connecting horizontal line marks intron 19. (B) An example of GeneScan analysis of RT-PCR products from the ΔF508 region (patient 3). The size marker appears as a red peak (260 bp). (C) A summary of the W1282X transcript levels in the W1282X/ΔF508 patients. These levels were compared to the level of ΔF508 transcripts. (D) An example of real-time PCR of the CFTR and the RPS9 genes, of RNA from 2 patients (nos. 8 and 9) homozygous for W1282X and a control individual with normal CFTR alleles. (E) A summary of the CFTR transcript levels, in the patients carrying 2 nonsense mutations. The levels were normalized to the level of RPS9 and compared to the normalized level obtained from a control individual with normal CFTR alleles. The asterisk marks the CFTR transcript level in patient 3, who was also analyzed as described in C, for comparison of the results of the GeneScan and real-time PCR analyses. (F) An example of GeneScan analysis of RT-PCR products of the CFTR and the KRT18, in a patient homozygous for the W1282X mutation (patient 6). The size marker appears as red peaks (260 bp and 300 bp). (G) A summary of the CFTR transcript levels in the patients carrying 2 nonsense mutations. These levels were normalized to the level of KRT18 and compared to the normalized level obtained from a control individual with normal CFTR alleles. The asterisk marks the CFTR transcript level in patient 5, who was also analyzed as described in C, for comparison of the GeneScan results. The levels in C, E, and G, are shown as mean ± SEM.